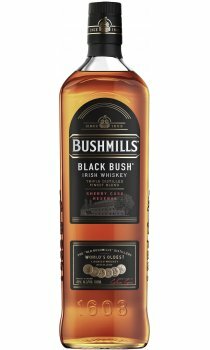 Black Bush Special Irish Whiskey is a rich, dark, 80-proof blend from the world's oldest licensed distillery, "Old Bushmills" distillery in County Antrim, Ireland. It is comprised almost entirely of single malt whiskey, making it a choice selection of deluxe whiskey aficionados. All of the Irish whiskey distilleries kiln-dry their malt in a heat-fired, not peat-fired, oven. This drying process lets the clean, clear taste of the malt and barley shine through. The combination is then returned to the cask for "marrying." As the whiskeys mellow together, the uniquely rounded bouquet, rich amber hue and distinctive taste of Black Bush is born. Black Bush has a distintive, full bodied aroma with spicy, malty and nutty sweet sherry notes. It is complex and well flavoured, slightly sweet with clear malt notes that are not masked by smoke. It is a whiskey to be enjoyed straight or on the rocks. I never could stomach Scotch, so Irish whiskey was a joy for me to discover, it was so smooth and pleasant. And so far Black Bush has been the cream of my experience; intense, warming, yet light on the palate and smooth as silk. It goes down well neat, but I prefer to add a drop of ginger ale, soda or spring water just to prolong the pleasure - I get drunk quickly otherwise!